Five government departments made a total of 5,511 user data requests to Internet and online service providers in 2013. The police took up 83% of those requests, followed by the Customs and Excise Department (16%). Not all of the government requests were complied with by local service providers. For instance, only 64% of the police requests were fulfilled by Internet companies, while none of the Companies Registry requests (7) were acceded to. Out of the five government departments that made data requests in 2013, three provided the number of the service providers involved in the government requests. The police led the way with requests made towards 4,557 service providers, followed by Office of Communications Authority (22), and Inland Revenue (4). 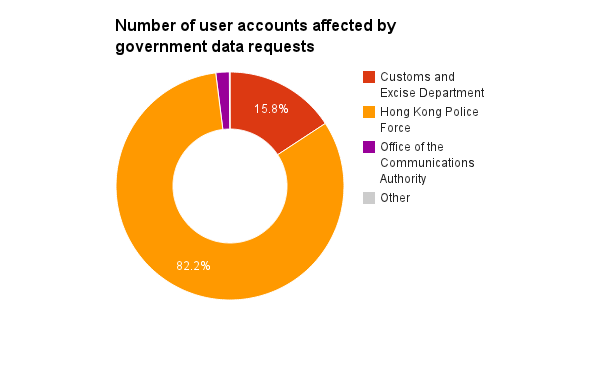 A total of 5,541 users were affected by government user information requests in 2013, according to information provided by the police (4,557), Customs and Excise Department (873), Office of Communications Authority (106), and Companies Registry (5). The Inland Revenue Department did not disclose such information due to the secrecy provisions under the Business Registration Ordinance and the Inland Revenue Ordinance. Data source: government release and data obtained by HKTR from government access to information officers.